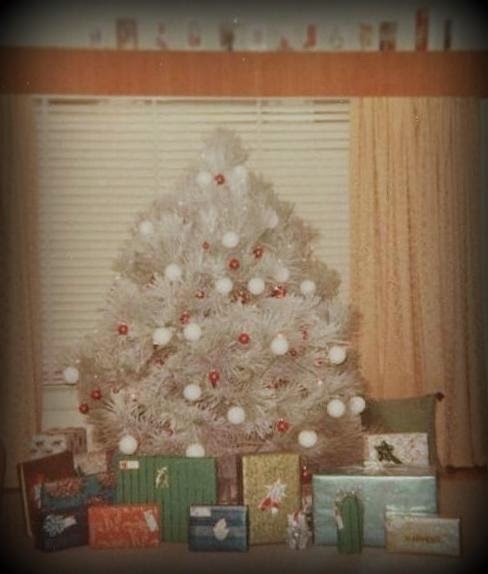 A Christmas tree made from bed springs might be grounds for divorce, but since I was already divorced, I did it a few years ago. I'm not handing out advice today, folks. Just commenting. Some married couples start new traditions with their young children. 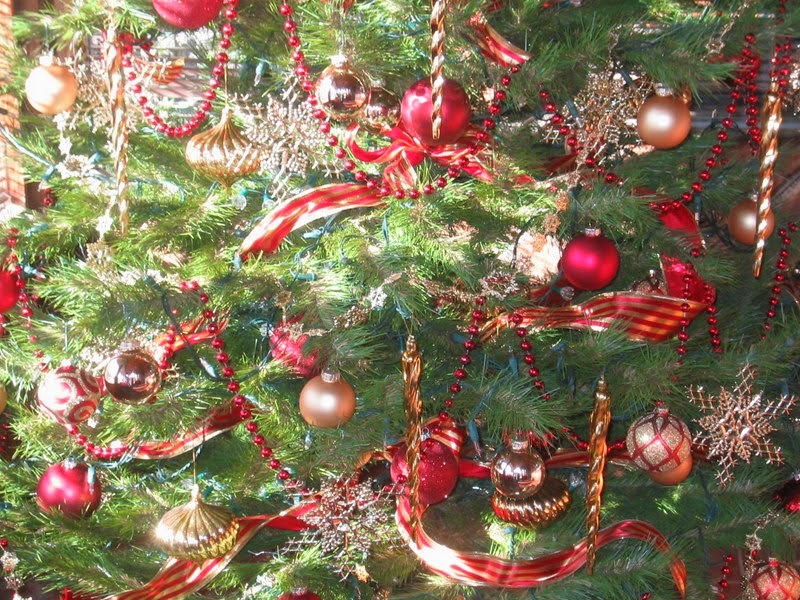 Handmade ornaments often become the "new us" tradition. Little ones love to see their artwork on display. They also like to remove and rehang the ornaments, so it makes sense not to invest in an expensive display until they get a little older. My grandsons move their ornaments around as part of their daily routine. This was a "nod to nostalgia" little tree I did one year. 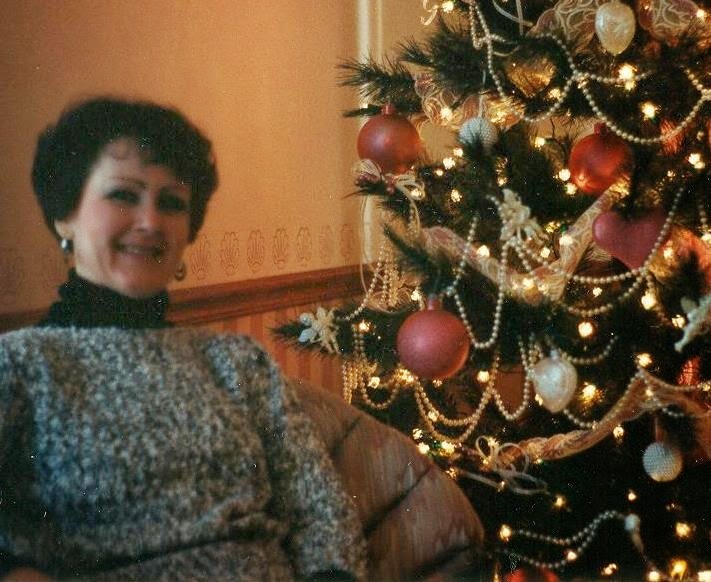 I have been around awhile, but not so long that I remember having lighted candles on the tree. 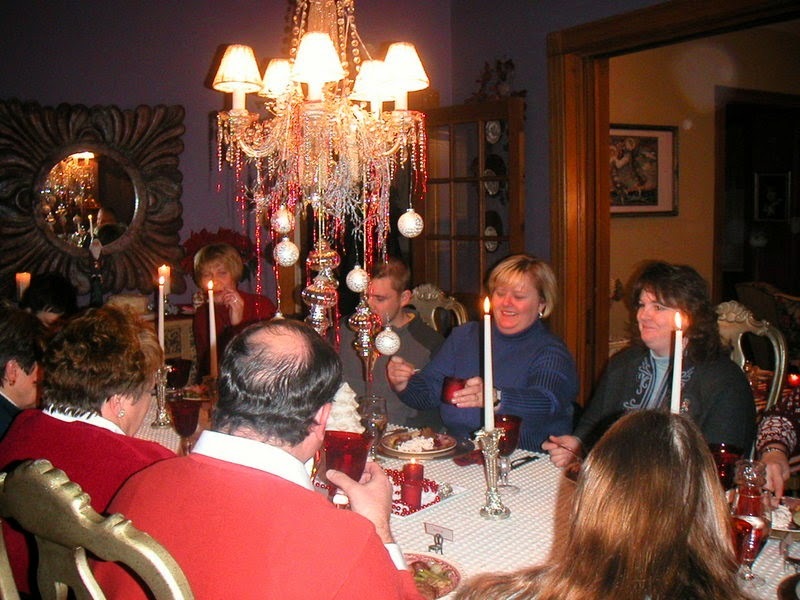 Some families have ornaments that have been handed down from generation to generation. Other's start collections of their own. jolly. Others just get creative and throw tradition out the window. 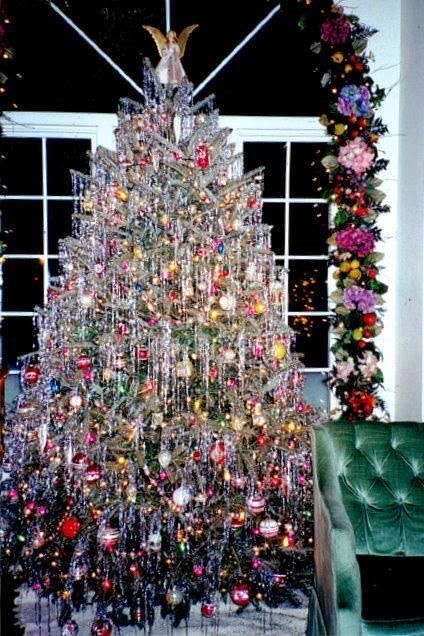 Most of you probably don't remember the days of the soft shiny tinsel that took hours to hang on the tree. It did look outstanding if it was applied abundantly and with patience. (My dad with Barb, me, Margaret and Jim. This might be a better example of how it was supposed to look. But who's comparing, right? 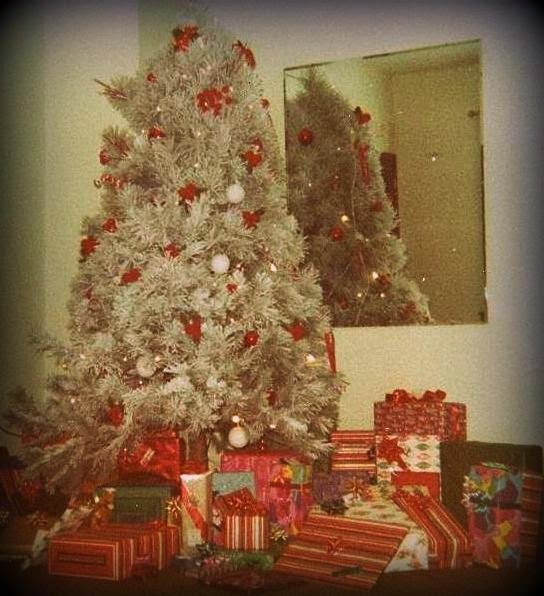 Another year the tree moved to the other side of the room but was, again, flocked. A little bigger tree this year and back to the other side of the room. That flocking stayed popular at our house for awhile. This is Sheila with her older brother, Danny. Looks like they are lamenting the lack of gifts under the tree. This was 2003. I have several pictures but none of a tree. 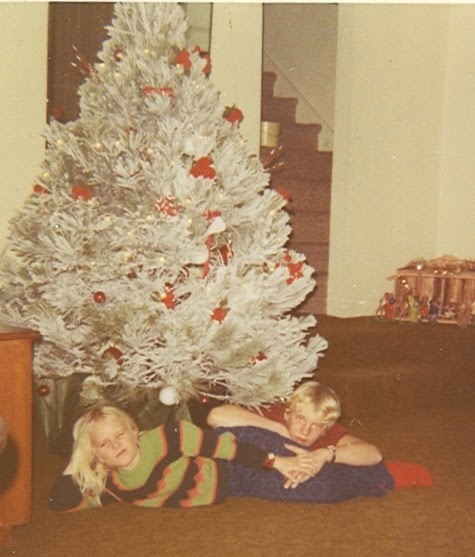 Maybe I just decided to make the chandelier the tree that year. It sorta looks like that was the idea. My trees tend to change a little from year to year. 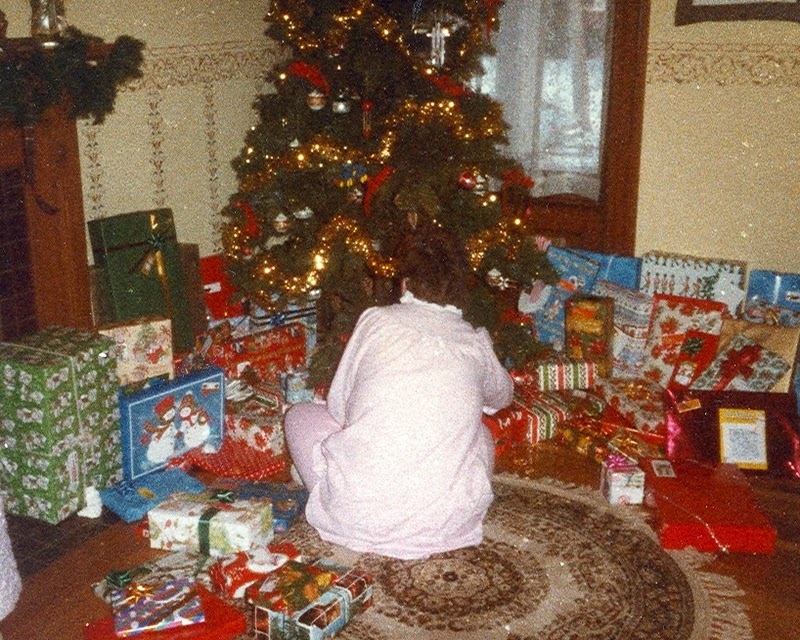 It was a green tree with pink and cream decorations more than once, but something on it always changed, be it the ribbon or the garland. 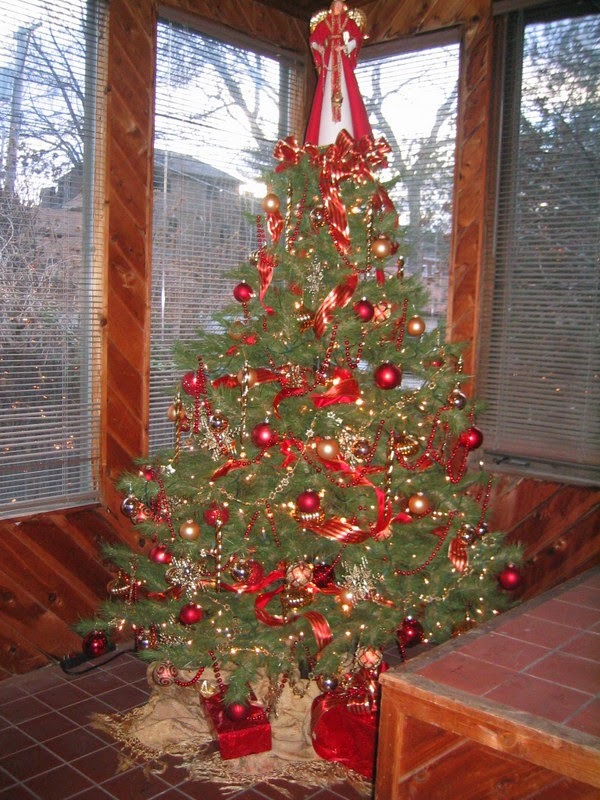 Then the ornaments changed to crimson and gold. It's a combo I still like and have plenty of decorations to prove it. But, my decor is so different now that those colors don't work as well. Here it is in chartreuse and teal. Another year it was shades of teal and sapphire. I branched out with a little more color on the silver, but only for one year. This was not one of my favorites. Years ago these were referred to as aluminum trees. This year I decided to put the tree in the living room. I chose sapphire and black because that seemed to work best with the colors of the room. Probably the same reason for the color choices in the above picture. 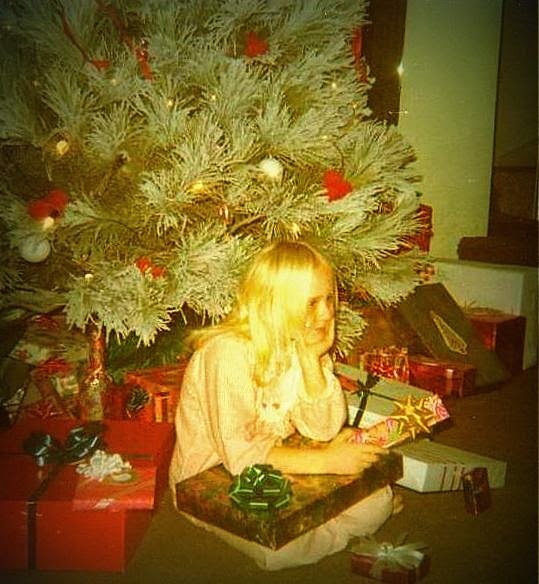 It's a little hard to see the ornaments in a photo. 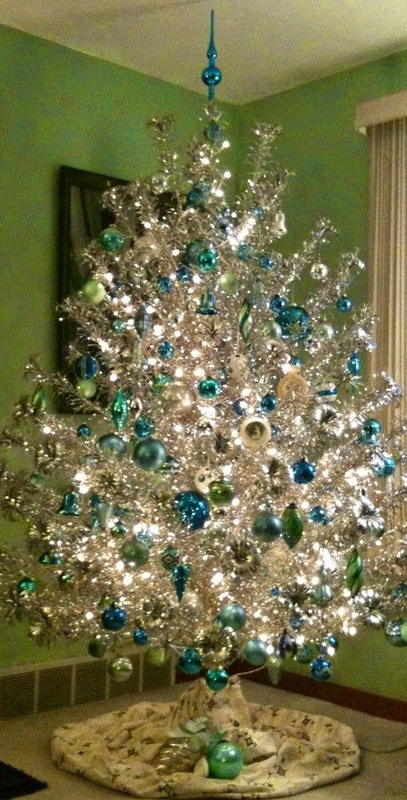 I do have a black mesh ribbon woven through the tree and crystals dangling from the branches. Even the closeup does not do it justice, although if you look closely you can see the crystals. The reflection in the window makes it look like there is a twin tree in the front yard which I find pretty cool. I rarely decorate with lights outside, but I bought pink lights thinking they would be great on the silver tree. OMG, big mistake. It was way too overpoweringly PINK. So I put them on a tree by the front porch. Mother nature assisted by turning it into a thing of beauty. I don't think I'll test mother nature's willingness to cooperate by putting them on the tree this year.